Above, Project Manager Tom Coviak compares the size of traditional AM signal-measurement equipment with the new, smaller SMR Receiver. 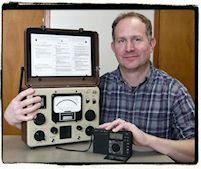 This handheld, battery-operated receiver can be utilized in the field to estimate signal intensities of broadcast radio stations. Though not a calibrated measurement device, it displays relative signal intensity in dbu, which can be used for rough translation to millivolts per meter (mV/m) in a given frequency range using an included correlation chart. It is also useful for measuring AM-band noise before station installation to determine the quietest frequency on which to broadcast. AM signal intensity is displayed as a two-digit read-out on the lighted front panel LCD display. Batteries are included and pre-inserted, so the unit powers up on-band and ready to operate. Included are illustrated instructions from us detailing procedures for measuring AM signals and AM-band noise. Assure yourself that your station never exceeds FCC limits. The SMR Receiver is the first device of its kind capable of measuring and displaying AM signal levels with a useful level of precision. Our project manager Tom Coviak explains it this way: "The SMR Receiver provides a digital LCD readout that correlates reliably to scientific measurement equipment…for about one-hundredth the price." Issues involving an antenna system, for example, are much less expensive to correct sooner than later, since they can affect electronic components downstream. We provide SMR Receivers with all new radio station packages; and they can be obtained separately, as well. Email us to learn more. AM Receive Band: 520-1710 kHz. Alternate Bands: FM, SW, MW, LW. Signal Intensity Display: 2-digit 15-99 (dbu). Tuning: Digital 10 khz LCD readout, lighted; auto/manual tuning; auto tuning storage. Power: 3- AA batteries (included), 6 VDC input jack. Audio Output: speaker, 3.5 mm headphone jack. Accessories: carrying strap and case. Dimensions : 5.3” X 3.4” X 1.0”. Instructions : manufacturer; guidance sheets for the use of SMR Receiver for AM noise and signal monitoring. Note: The Signal Measurement Radio Receiver is unshielded and its readings may be affected by strong electromagnetic fields emanating from nearby antennas to which the receiver is not tuned. Use the receiver for relative signal measurements, such as, to prove a change in signal intensity due to a an antenna or transmitter problem or to compare background noise levels on various radio frequencies.